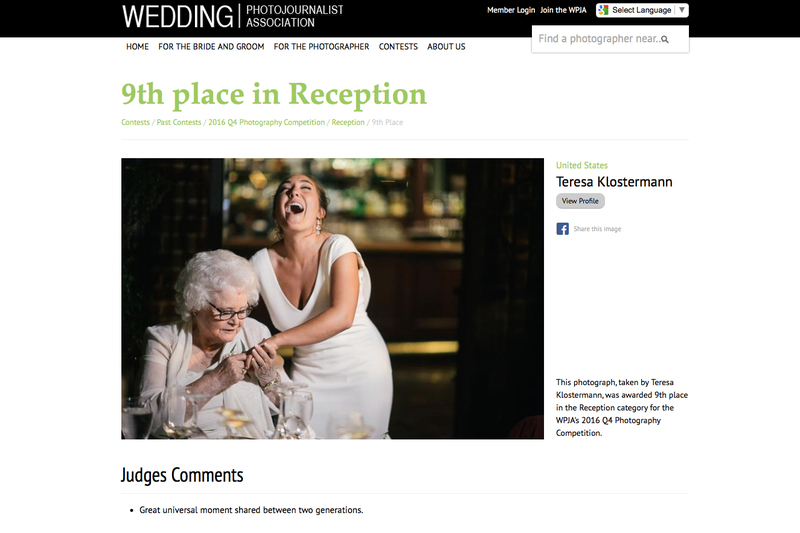 2016 WPJA Q4 Photography Contest Award Winning Photo - Sacramento Wedding Photographers | Teresa K photography Facebook Twitter Instagram Pinterest Client's Area Search this site. I’m super thrilled to have placed in the 2016 WPJA Q4 photography contest with this sweet moment between Betsy and her Grandmother at her Firehouse Restaurant wedding reception this fall. The number of uber talented photographers in the WPJA is immense and makes the recognition that much sweeter! The Wedding Photojournalist Association is pleased to announce the results of the Fourth Quarter WPJA Photography Competition. Join us as we congratulate all the winners. The 2016 Q4 Contest showcases the wedding photojournalism of WPJA members from the final quarter of the 2016 year in 15 categories.